Irish Ham Recipes make an easy and basic meal for your family. Whether you call the meat "bacon" or "ham" is not important. When you take a bite, you will be happy either way. Here are some recipes you may like to try on a chilly evening sometime soon. 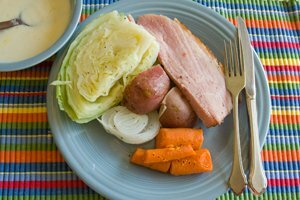 My mom, Elizabeth, likes to make this ham and cabbage recipe by baking the ham first. Some people like to boil the meat and use the stock to cook with the cabbage. This recipe is simpler and doesn't take as long. Give it a try! Bake ham according to directions on package (approximately 30 minutes per pound). Boil carrots, cabbage, potatoes and onions in separate saucepans until fork tender. Drain off the water. Butter and salt and pepper each to taste. Cut ham into thick pieces. You may also want to add a white cream sauce over the meal. If you'd like a taste of Ireland, go to the Food Ireland website and make an order. The service and quality are great! Here is a traditional Irish ham recipe called Coddle. In this meal, the meat used is Irish bacon. Put the bacon and sausage in a sauce pan. Pour boiling water in the pan to cover the meat. Bring the water to a boil again and simmer for five minutes. Drain and keep the liquid aside. Peel and slice the onions and potatoes. Place the onions, potatoes, bacon, and sausage into a greased casserole dish or a heavy saucepan. Cover with the liquid stock you set aside, and season with salt and pepper. Put the lid on, simmer on the stove or place into an oven heated to 350 degrees Fahrenheit for about 30 minutes until done.